TomTom GO 5000 Trucker is a truck sat nav with a 5-inch screen that has a sharp, hi resolution display. Included with this TomTom are full maps of Europe. These maps are free to update for the lifetime of the product which you can update 4 times per year. Information shown on screen includes speed limit and your speed, the road name you are traveling along and directions for your route. TomTom IQ routes tells you the fastest routes and accurate arrival times. TomTom GO 5000 can accept your vehicles dimensions, vehicle type, weight, cargo type and speed. Knowing this information this TomTom truck satnav will then only route you along appropriate roads that are suitable for your truck or lorry. Features also include advanced lane guidance and you will always know about traffic congestion in the road ahead which is free for the first year. TomTom Trucker 5000 has been discontinued. 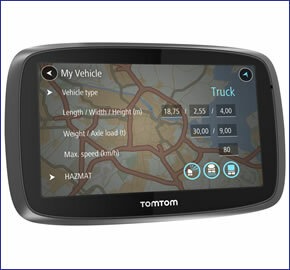 Accessories for the TomTom Trucker 5000 can be purchased here. TomTom GO 5000 Trucker is a truck satellite navigation system that has a 5-inch touch screen that displays a sharp, hi-resolution image and it features Quick GPS fix technology for quickly getting a GPS fix. The mapping included on this TomTom is European mapping. You can download map updates free for the lifetime of the product up to 4 times a year which include changes to roads, addresses and points of interest. The TomTom GO 5000 can accept your vehicles dimensions, vehicle type, weight, cargo type and speed. Knowing this information the TomTom truck satnav will then only route you along appropriate roads that are suitable for your vehicle. On-screen information includes speed limits and your speed. Plus the road name is displayed at the bottom of the screen and directions are depicted on the screen for action in a certain, given distance. Furthermore it calculates the fastest routes and it also provides accurate arrival times. In addition a route bar shows you traffic and speed camera information regarding the road ahead. You will also receive advanced lane guidance that provides guidance as to which lane to be in at all junctions. My Drive feature enables you to use your Smartphone, Tablet or PC to review real-time traffic information before your journey. You can even plan your route on these devices before sending the best route to your truck sat nav. This TomTom also features bigger menus and larger buttons for easy navigation and navigational directions are spoken to you via an in-built speaker. There is a Tap and Go feature that makes it possible to navigate to locations at the press of the touch screen; just tap your destination and select 'drive to destination'. The TomTom Trucker 5000 will accept 255 multistops along each journey and you can store up to 99 routes on the TomTom. For each saved journey you can store 255 multistops. This TomTom also includes lifetime TomTom Traffic information which is free of charge for the first year. Use the quick search tool on the TomTom GO 5000 to find any destination simply. You can also zoom in and out by pinching the touch screen. There is also a points of interest database built in to the TomTom GO 5000 including petrol stations, hotels, restaurants and millions of other POIs. You can additionally store 'My Places' which stores you favourite locations to navigate to at a quick press of the touchscreen. With the TomTom GO 5000 you will also get a 1 year free subscription to fixed and mobile speed camera locations which also includes speed limits. The speed camera database covers 36 countries so you will also know where the speed cameras are when driving abroad. This database of many speed camera locations is regularly updated. The TomTom GO 5000 has a battery life of 2 hours and you can also speak locations and hence navigate hands-free to your destination. You can mount the TomTom GO 5000 on the included Click and Go windscreen mount or on the optional bean bag dashboard mount. ‣Full Lifetime European Mapping. Updates downloadable 4 times a year. ‣Enter your trucks dimensions for truck-friendly routing. ‣Multi-route planner - navigate around up to 255 different destinations just by adding the post codes. ‣Save 99 routes to your TomTom Trucker. Please note each saved jounrey can include 255 multiple stops along the route. ‣Displays your speed and speed limit on screen. ‣My Drive feature allows you to review your route on a tablet, smartphone or PC before sending to your TomTom Trucker satnav. ‣TomTom traffic information technology free for the first year. ‣1 Year Free subscription to Speed Camera Database. ‣Tap and Go quick navigation to locations. ‣Points of interest database includes petrol stations, restaurants, etc. TomTom Trucker 5000 mounts on the inside of your vehicle using the supplied Click and Go Mount. TomTom Trucker 5000 can be powered directly either from its internal battery if it's fully charged or powered from the cigarette lighter socket. We do not recommend using a third party charger with this product. A mobile phone USB charger or a laptop may not be powerful enough to reliably charge the TomTom Trucker 5000 and may provide an incorrect voltage or insufficient power. TomTom Trucker 5000 provides advanced warning of all fixed speed cameras, SPECS and many laser sites using a speed trap database. The database is free for the first year. The ongoing cost of the speed camera database is £19.99 per year. Looking for genuine accessories and spares for the TomTom Trucker 5000? All parts availble to buy from ActiveGPS are genuine TomTom product and specifically designed for use with the Trucker 5000. Accessories available to purchase include a travel case, travel case, replacement windscreen mount and a beanbag dashboard mount.